Allen Garden’s Palm House, Toronto (photo July 2018). The greenhouses in Allan Gardens are among the city’s relatively unknown treasures. Hidden amidst the foliage of the park, numerous motorists in downtown Toronto speed past them daily as they navigate the busy streets that surround them, but few ever take the time for a visit. Allan Gardens is bounded by Jarvis Street on the west, Sherbourne on the east, Carlton on the north and Gerrard Street East on the south. Their official postal address 160 Gerrard Street East. The greenhouses are open to the public every day of the year and there is no admission charge. On frosty winter days, the greenhouses provide a cozy oasis of lush growth and warm humid air that remind us of southern climes. In summer, the plants in the park outside the greenhouses pale in comparison to those growing indoors. Allan Gardens has an interesting history, as during the 19th century, before the present-day structures were built, there were pavilions containing greenhouses. The story of Allan Gardens is interwoven with the history of the Toronto Horticultural Society, founded in 1834, the year of Toronto’s birth as a city. Sir John Colborne, the Lieutenant Governor of Upper Canada (1828-1836), was the society’s benefactor. Colborne Lodge in High Park is named after him. The Society’s purpose was to introduce to the province improved species of plants, especially fruits and vegetables. Also interwoven into the history of Allan Gardens is George William Allan, a prominent lawyer and politician who served as Toronto’s 11th mayor, from 1854 until 1856. In 1858, two years after his retirement from city council, he donated five-acres of land to the Horticultural Society. The Society gratefully accepted Mr. Allan’s generosity and the deed to the land changed hands on March 14, 1860. The newly created park, referred to as the Horticultural Gardens, was to become a botanical garden and a pleasant green space for strolling and picnics. On September 11, 1860, the Prince of Wales, later to reign as King Edward VII, visited Toronto and officially opened the gardens. On the grounds, he planted an oak tree that grew to a prodigious size, for many decades providing pleasant shade from the heat of Toronto’s summer sun. Unfortunately, in 1938 the gigantic tree was struck by lightning, and the remaining sections were removed. On the same royal visit (in 1860), the wife of George William Allen also planted a tree, which for safety reasons was cut down in 1956. Throughout the remaining decades of the 19th century, Allan Gardens was one of the most popular attractions in the city. To enlarge the park, the City of Toronto bought a parcel of land from Mr. Allan. It surrounded the property that he had originally donated. The funds for the purchase were derived from the city’s “Walks and Gardens” funds. The City then leased the newly acquired land to the Toronto Horticultural Society, for a nominal sum. A stipulation was written into the agreement that the grounds were to be publicly accessible and free of charge for everyone, in perpetuity. In 1864, to attract more visitors, the Horticultural Society spent $6,000 on improving the park and constructing a pavilion with greenhouse space where plants could be grown indoors. The pavilion built in 1864, which was sometimes described as being “rustic.” Photo, Toronto Public Library T11684. An 1870s photo of the pavilion. Toronto Public Library, r-5551. View looking west along the walkway that led to the pavilion. However, despite the pavilion being very popular with visitors, it was not well maintained. Also, its size had become inadequate for the requirements of the venue. In 1878, only fourteen years after it was built, it was demolished to enable the construction of another pavilion. To finance it, a loan of $20,000 was secured by the Society by offering the park’s grounds as security. In the summer of 1879, the new Horticultural Pavilion opened. Designed by the Toronto architectural firm of Langley, Langley and Burke, its impressive dimensions were 75’ by 120’. It was constructed mainly of wood and iron, with many large glass surfaces to allow sunlight to enter the interior. Its design was inspired by the Crystal Palace built for the Great Exhibition of 1862, in London, England. Toronto’s pavilion was located a short distance west of the previous one, midway between Carlton and Gerrard Streets. A 45’ by 48’ conservatory was later added to its south side. The stage of the pavilion’s auditorium accommodated as many as 200 performers. It was considered one of the premier facilities of its kind in Canada, competing with the St. Lawrence Hall on King Street East for the honour of being the cultural centre of the city. From the day the pavilion was inaugurated, it was in great demand for concerts, gala balls, conventions, public lectures and of course, flower shows. In 1882, Oscar Wilde lectured in the Pavilion Hall. The architects that designed the second pavilion were also commissioned to erect a 25’ fountain, with a 45’-diameter stone basin. It was constructed on the same site as the former pavilion. The fountain no longer exists, and I have been unable to discover when it was dismantled. Photos reveal that it was still there in 1925. Today, there is a similar fountain in St. James Park on King Street East, though it is on a much smaller scale. (Left) The fountain in Allan Gardens and in the background the new pavilion that opened in 1879. Photo taken in 1880, Toronto Public Library, r-5572. (Right) The small fountain in St. James Park on King Street East that resembles the one that was once in Allan Gardens. Photo taken in 2011. In 1888, despite the popularity of the gardens, the Society was bankrupt. As a result, the City of Toronto assumed ownership of the property and its assets, paying off the $35,000 mortgage. The City now constructed a decorative fence around the park and replaced the gas lamps with those that were electrified. In 1894, the City allocated considerable funds to modernize the pavilion. A refreshment room was added and the old conservatory was replaced with a larger facility that was 90’ by 61’. Its architect was Robert McCallum, who served as the City Architect of Toronto from 1903 until his forced resignation in 1913. The structure was an ornately grand four-storey building, with fancy architectural trim and sweeping verandas. I believe that it was somewhat oriental in appearance. The west (rear) facade of the Pavilion that opened in 1879. Photo taken in 1896, City of Toronto Archives, S0376, Fl005, item 0075. Interior of the pavilion that opened in 1879. The pavilion on June 6, 1895, the Rosary (rose garden) in the foreground. Toronto Archives, F1548, S0393, item 0253. Photo taken in 1896 of the east (front) facade of the pavilion. The fountain designed by Langley, Langley and Burke is visible in the foreground. Toronto Archives, F 1231, item 0557. In 1901, the name of the park was changed to Allan Gardens, in honour of the man who had donated the land to originally create the park. Unfortunately, on June 6, 1902, a disastrous fire destroyed the Pavilion, along with sections of the new conservatory. Robert McCallum was again hired to design its replacement. After the fire, for the next few years the only sections of the pavilion that were open to the public were those that survived the flames. It was eight years before a new pavilion appeared. Inaugurated in 1910, it contained an impressive collection of native and foreign specimens, including rare orchids and other exotic plants and palms. Reflecting popular tends of the 19th century and the first decade of the 20th century, the gardens and pathways in the park were designed in a symmetrical manner. The sprawling greenhouse facility still exists in Allan Gardens today, its main building named the Palm House. The latter structure is classically proportioned, possessing an enormous dome. During the 1920s, the greenhouses were expanded when two new display structures were added to the Palm House. They were attached to the north and south sides of it. In 1957, an additional greenhouse, possessing building extensions, was constructed, which expanded conservatory display space. The adjacent garden areas were also reconstructed. In 2003, the University of Toronto’s former botany education facility greenhouse, built in 1932, was dismantled and relocated to Allan Gardens to accommodate the construction of the institution’s new pharmacy building. View of the Palm House that opened in 1910. Photo taken in February 1913. The greenhouses on either side of it had not yet been built. Toronto Archives, F 1231, item 0547. The Palm House in July 2018, the greenhouses built in the 1920s visible on either side of the structure. blogTO, and information provided in the greenhouses in Allan Gardens. “ Lost Toronto”—employing detailed archival photographs, this recaptures the city’s lost theatres, sporting venues, bars, restaurants and shops. The richly illustrated book brings some of Toronto’s most remarkable buildings and much-loved venues back to life. 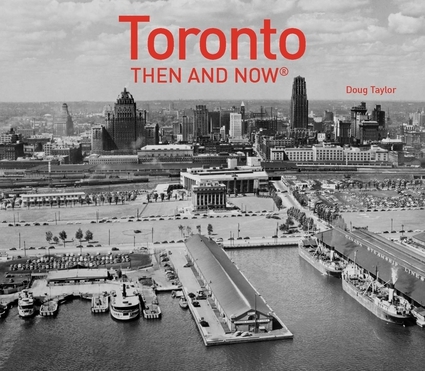 From the loss of John Strachan’s Bishop’s Palace in 1890 to the scrapping of the S. S. Cayuga in 1960 and the closure of the HMV Superstore in 2017, these pages cover more than 150 years of the city’s built heritage to reveal a Toronto that once was. Book also available in most book stores such as Chapter/Indigo, the Bell Lightbox and AGO Book Shop. (ISBN 978.1.62619.450.2) and may also be purchased on Amazon.com. Many cities throughout the world have landmark structures that are easily recognized, even when there are no captions or context that identify their location. A few prime examples are the Eiffel Tower, United Nations Building, Golden Gate Bridge, Coliseum, Taj Mahal, and Buckingham Palace. If photos of these buildings are displayed, there is no need to identify the city where they appear as they have been well known for decades and in some instances, for centuries. Toronto possesses two such structures—the CN Tower and the New City Hall. When I was travelling across Europe and Asia in the late-1970s, in the windows of travel agencies, I sometimes saw photos of the New City Hall and the CN Tower. The images were being employed to promote Toronto as a tourist destination. Most people I talked to readily knew where these landmarks were located. Toronto was not always as well known internationally as it is today. In the 1930s, the city remained a quiet and loyal part of the old British Empire. During the Second World War its economy expanded as it focussed on contributing to the war effort. After peace was declared in 1945, growth was stimulated exponentially by the pent up demand for housing, commercial buildings and entertainment. The post-war years were also when immigration increased immensely as thousands of people chose Toronto as their new home. The city’s growth continued unabated throughout the 1950s. At the end of the decade, development was further intensified by the opening of the St. Lawrence Seaway in 1959. Ships were now able to bi-pass Montreal, which was at that time was Canada’s largest city. Thus, the 1960s became a period of extremely robust construction. Unfortunately, because of the city’s rapid expansion during this decade, many of the city’s heritage buildings were demolished. Many low-rise structures in the downtown were destroyed and replaced with towering skyscrapers. It was as if City Council had embraced the motto: “out with the old, in with the new.” Most Torontonians embraced this viewpoint, feeling it was necessary if the city were to enter the modern era. As a result, few objections were raised about the destruction of older buildings, including those that had survived for over a century. Many believed that these structures had little to contribute to the new urban scene. As well, the voices of those concerned about architectural preservation were mostly absent from the scene. Unfortunately, some developers, aided by politicians, continue to favour this destructive attitude today, though I admit that things are improving. However, despite the damage created by city planners of the 1960s, it was during this decade that Toronto built a magnificent New City Hall. It began when City Council and Mayor Nathan Philips initiated a world-wide search for an architect. Five hundred and twenty submissions were received from forty-two countries, the winning design by a Finnish architect — Viljo Revell. Its construction commenced on November 7, 1961, its architecture a dramatic break from the ultra-conservative styles of the past. For over a century, since its incorporation as a city in 1834, Toronto had produced some remarkable buildings, but few that ever created as much praise and condemnation as the New City Hall. When architectural drawings of it were published in the newspapers, reviews were mixed. One reporter wrote that Revell was to be Mayor Philips’ Christopher Wren, who had designed St. Paul’s Cathedral in London. Others declared that the design of the new council chamber resembled an ugly giant oyster, and expressed doubts that any pearls of wisdom would ever be expressed within it. As construction costs continued to soar, many citizens felt that the entire project was fishy. After all, politicians at City Hall were well known to hook and gut taxpayers by wasting dollars on grand schemes. The unfamiliar futuristic design of the new civic building appeared to be proof of this suspicion. The council chamber in the New City Hall was also compared to a flying saucer. Some expressed the opinion that it might float upward into the skies above due to the political hot air that would be produced inside it by politicians. However, as the edifice neared completion, people gazed in wonder at the oyster-like city hall chamber, nestled between the two majestic curving towers. Comparisons to fishy endeavours faded from the minds of most citizens, although some still questioned the $25 million building costs. The structure possessed many impressive features, the one that perhaps garnered the most attention being the pillar that supported the council chamber. It was twenty feet in diameter and extended down to the bedrock below. The two towers were not energy efficient by today’s standard, but they were impressive to behold. It was as if Toronto had architecturally finally entered the 20th century. When the building was officially opened on September 13, 1965 by Governor General Georges Vanier, the weather was cloudy, but nothing dulled the enthusiasm of Torontonians. Fighter planes roared across the sky above the towers and fireworks crackled, sputtered and exploded in the air above it. Mayor Jean Drapeau of Montreal was heard to remark glumly that he doubted that his city would have ever have a building to match it. Taken on June 22, 1964, the photo looks northeast from the space that became Nathan Phillips Square. In the foreground is the old Registry Building that is being demolished. To discover the history of this neo-classical structure, follow the link https://tayloronhistory.wordpress.com/2016/03/11/torontos-old-registry-office-building/ . The above image is from the Toronto Archives, Fl268, it462. View of the New City Hall in 1964 as construction nears completion. City of Toronto Archives, F1025, fl 0001, id. 0135. The New City hall in the late-1960s. Toronto Archives F0124, fl0002, id 0002. Skaters on the ice in the reflecting pool in Nathan Philips Square, view gazing north. Photo January 15, 2019. Summer in Nathan Philips Square, view looking north toward the twin towers of the New City Hall, the curved pillars in the foreground extending over the east side of the reflecting pool. Toronto Archives, F 0124, fl 0003, id 0092. Reflecting pool in Nathan Philips Square, the Canada Life Building in the background and the north facade of the Sheraton Centre Hotel on the upper left-hand corner of the photo. The 20-foot diameter column that supports the spaceship-like council chamber. The pillar rests on the bedrock below. City Hall Chambers where city council meets. Photo taken during Doors Open in 2012. The mayor’s office in the New City Hall, photo taken in 2012. View from the roof of the Old City Hall, looking west toward the Canada Life Building on University Avenue. View from the roof of the New City Hall, gazing south over Nathan Philips Square. The large building facing north overlooking the square is the Sheraton Centre Hotel at 123 Queen St. West. Behind it is the CN Tower. On the right-hand (west) side of the square is the eastern part of Osgoode Hall. View looking east on Queen Street West from the south side of Nathan Phillips Square. The food trucks have been a familiar part of the scene for decades. The tower of the Old City Hall is visible in the background. View from south side of Nathan Philips Square. View gazing north from Nathan Philips Square at the New City Hall in the summer of 2012. Gibson House in North York, Toronto, at 5172 Yonge Street. Gibson House, the home of David and Eliza Gibson, recreates life in a 19th century farm house, an era from our past that contrasts with our busy modern world. The early decades that this house represents may appear quiet and less-hurried when compared to today, but visitors soon learn that this is a mere illusion. It was an age that lacked modern technology, meaning that life was harsh and labour intensive. Despite this, many tasks performed by the Gibson family remain familiar to us today, while others are thankfully remote. The story of the original inhabitant of the house is fascinating, as they witnessed and participated in some of the most turbulent events in the history of our province. David Gibson was born in 1804 in the parish of Glamis, Forfarshire (Angus), Scotland. His father, a tenant farmer, apprenticed him at 15 years of age to a land surveyor in Forfarshire. When David’s apprenticeship ended in 1824, he immigrated to North America. His uncle, Alexander Milne, who lived in Markham Township, Upper Canada (Ontario), encouraged him in this venture by informing him that it was relatively easy to qualify as a surveyor in the province as surveyors were in great demand. David sailed for North America in the spring of 1825 and arrived in Montreal. Although he found employment there, a permanent position in his area of expertise eluded him. Finally, even though a well-paid position as a grocery merchant was offered to him, he departed Montreal and journeyed to his uncle’s farm in Upper Canada. Upon his arrival in the province, he was still unable to immediately secure the employment that he desired. However, upon passing the provincial examination for surveyors in December 1825, he was appointed deputy-surveyor of roads and in September 1828, surveyor of highways for the southern part of the Home District. In a mere three years, he was well established and was busy mapping the roads and avenues of early-day York (Toronto). In 1828, Gibson married his cousin, Eliza Milne, and the following year they bought a farm lot on north Yonge Street, nine miles north of the town of York. Located in an area that is today named Willowdale, they built a wood-frame house. Under David’s guidance, the property became an active and progressive farm. However, despite his busy life as a farmer and surveyor, David Gibson set aside time to become involved in public affairs. In 1831 he was elected president of the York Temperance Society. It was during these years that he saw first-hand the inequalities of the political system in Upper Canada and became an avid Reformer. His views led him to a political association with William Lyon Mackenzie. In 1834 and 1836 Gibson was elected to the assembly for the First Riding of York, where he became known as a reasonable but forceful supporter of reform. It is thought that because of his commitment to the reform movement, the newly-incorporated City of Toronto City Council gave him contacts surveying streets and sidewalks. However, despite his many activities, he continued to farm and prosper. He won several prizes from the Home District Agricultural Society, and successfully sold livestock at ever-increasing prices. In December of 1837, Mackenzie began advocating for open rebellion against the government. Gibson learned of the plans only two days before events were to begin and was not fully aware of Mackenzie’s intentions. When he finally met with Mackenzie, the rebel leader demanded that Gibson choose sides. Gibson was hesitant. However, he eventually agreed, even though he believed that rebellion was wrong. He reasoned that such an extreme measure might force the government to institute reforms that were badly needed. On a cold December morning, though he harboured doubts about the course of action, Gibson was present at Montgomery’s Tavern where Mackenzie and the rebels had gathered. Unfortunately, the tavern was raided by government forces lead by James Fitzgibbon and Allan McNab. During the skirmish, Gibson protected the loyalist prisoners held inside Montgomery Tavern from mistreatment, and eventually led them to safety. At this point, Gibson left the rebels and did not join in the march down Yonge Street. The loyalist prisoners were grateful for their freedom and spoke on Gibson’s behalf. Despite this, Lieutenant Governor Sir Francis Bond Head ordered the militia to torch the house on Gibson’s farm. While it was in flames, after ensuring that her children were safe, Eliza Gibson ran into the burning building to retrieve the clock-face and mechanical workings from their treasured wooden long-case (grandfather) clock. In her skirt, she carried out of the house the valuable parts of the clock. As there was a warrant for his arrest, Gibson hid near Oshawa for a month, and then, escaped across Lake Ontario to Lockport, New York. While in the United States, he avoided any contact with Mackenzie, who had referred to him in an article as a coward, because Gibson had left the rebels after the fighting at Montgomery’s Tavern. Gibson finally secured employment in Lockport as an engineer on the Erie Canal and sent for his family to join him. He prospered and soon was able to purchase a farm. Although he was pardoned in 1843 by the government of Canada West (Upper Canada) on the charge of treason, he remained in the United States and in 1846 applied for citizenship. In 1848, however, he lost his employment contract on the Erie Canal. As a result, after 11 years in exile, he decided to return to his farm in Canada West (today named Ontario). While Gibson was in the United States, his Yonge Street property had been tended to by relatives. Repossessing the farm, he was determined to re-build and also resume his profession as surveyor. He hired a farmhand to assist him when he was away surveying. Interestingly, the clock works that Eliza had rescued from the flames in 1837, had been placed in a new case after Eliza, David, and their children re-united in Lockport, New York. When the Gibson family returned to the farm in 1848, the long-case clock was brought with them. In 1851, the Gibson family built an impressive Georgian Revival farmhouse at 5172 Yonge Street. A narrow dirt lane led from the farmhouse to Yonge Street. A few years after the house was built, an addition was erected to provide accommodation for the labourer who worked on the farm. It was a separate second-level structure attached to the west side of the house, with a separate staircase and entrance that connected it to the kitchen. The worker used the separate entrance to enter or depart the house, and only visited the parlour and living space if he were invited by the family. In 1855, Gibson opened a post office just north of his farm. In that decade, there were about 150 people living in the community, which was known as Kummer’s (or Cummer’s) settlement. David Gibson suggested that the name be changed to Willowdale, because of the numerous willow trees in the area. The house was home to David and Eliza and their four sons and three daughters. After David and Eliza passed away, their son Peter Silas Gibson and his family lived it until 1916. Then, the house was occupied by a series of different owners and tenants. To rescue it from demolition, the Township of North York purchased the property in 1965. Gibson House was restored and opened as a heritage museum on June 6, 1971. Today, it operates as a functioning household by interpreting 19th-century domestic skills involving cooking, sewing, gardening and farming. Visitors are able to tour this historic Georgian-style farmhouse and museum is at 5172 Yonge Street. The clock rescued by Eliza can still be seen in a prominent position in the house. I am indebted to the tour guide who showed me the rooms within Gibson House and the informative signs posted in the hallways to help visitors understand 19th-century life. Entrance in 1913 from Yonge Street to Gibson House, which in that year contained the offices of Peter S. Gibson. The view gazes west, with the house partially obscured by the trees. Toronto Public Library, Call number NYHS00633. View looking south on Yonge Street from Park Home Avenue in 1914. The rural qualities of the community are clearly evident. This is the view a person would have seen in 1914 after exiting the laneway from the Gibson House and turning southward toward the city. City of Toronto Archives, Call number NYHS00010. View looking west at the land between Yonge Street and the Gibson House. The photo is dated 1957, but I suspect it was taken much earlier as the porch is missing from the front of the house. In the next photo, dated the same year, the porch has been restored. Toronto Public Library, Call number SI-4167. East and north facades of Gibson House. The photo is dated 1957, but as the house appears restored, the date of the photo is suspect. Toronto Archives, f 0217, S 0249, fl 1009, item 0001. Controller Mel Lastman in front of Gibson House in 1970, when the house was overshadowed by a 17-story apartment building on its north side. Toronto Public Library, tspa 01007065f. The front of Gibson House in June 2018. Georgian Revival in style, it has a symmetrical facade, with nine windows, and a Greek portico. The Greek-style portico and the door with its side-light windows and fan-shaped transom window above, which add elegance to the entranceway. The kitchen of Gibson House with its large open fireplace and work table. This is where meals were prepared for family members, the domestic servant, and the farm worker. The fireplace with various 19th-century utensils required for cooking. A cozy table set for tea beside the fireplace in the dining room. Tables set in the dining room for a Mothers’ Day tea in June 2018. The clock that contains the face and workings that Eliza rescued from the fire in 1837. The wooden case for the clock was acquired while the family lived in Lockport, New York. The clock was carried across the border when the Gibsons returned to Canada West (Upper Canada, now Ontario) in 1848. Staircase leading from the ground-floor level to the second storey of the Gibson House. Photo June 2018. The charming young woman in the photo provided an interesting and insightful tour of the home. View from the top of the staircase, the sewing room on the second-floor level directly ahead. The boys’ room where James, William, Peter, and George slept, two in a bed. In the girls’ bedrooms, the front room was where Elizabeth (Libby) slept. She had a writing desk beside the window where perhaps a few love letters were penned. The room behind hers was for her sisters, Margaret and Hellen. Two years after moving into the house, in 1853, Elizabeth married and departed her parents’ home. The bedroom of David and Eliza, containing the best furnishings in the house. On the far wall is a “dumb stove,” a circular device in a stovepipe that radiates heat from the parlour stove downstairs. As the heat rises through the stovepipe and reaches the “dumb stove,” it spreads out and heats the room more efficiently. Clothes placed near the dumb stove are kept warm for the morning. The bed of David and Eliza in the master bedroom. The sewing room was where clothes were made for the family and where all mending and stitching was performed. In 1851, the hired girl who assisted Eliza with these chores, was 20-year-old Catherine Flynn, an Irish immigrant. Domestic work was not highly valued in this century and Catherine was likely paid about half the wages of the farm worker. However, her room and board were included. She slept in the sewing room. The guest bedroom, a well-furnished room that was designed to impress visitors. Due to the difficulty of travelling any distance after sunset, guests who arrived for dinner often stayed the night. The room of John Bosa, the young Englishman who was the farm worker that performed most of the labour on the farm while David Gibson was away surveying. The room was his bedroom, sitting room, and bathroom as it contained a chamber pot under the bed. He ate in the kitchen and entered his room via the back staircase. He did not enter the parlour or living space of the family unless invited. However, because he had a cozy room within the house, he was likely viewed as a valued member of the household. John Bosa likely sat in his room many an evening after a hard-day’s labour on the farm, soaking his tired feet. The office of David Gibson, where he worked on the maps and documents related to his employment as a surveyor. The drafting table is beside the window to take advantage of the available daylight. A person can only speculate how many times a member of the Gibson family peered out this window at the farmland and orchard on the property. The Noble Block is a commercial row of red-brick buildings, visible from the busy intersection of Queen and Spadina. Located on the north side of Queen Street, they appear in the distance, in the centre of the photo. The camera faces east from the southwest corner of Spadina and Queen Streets. The Noble Block consists of a row of seven red-brick buildings that extend from 342 to 354 Queen Street West. The two buildings to the west of them (left-hand side in photo), numbers #356 and #358, are not part of the Noble Block, but architecturally complement it. Today, walking along some sections of Queen Street West, a person is able visualize Toronto as it appeared in the 19th-century. Unfortunately, most visitors do not see the historical aspects of the buildings as they rarely gaze above the first-floor level, where the shops windows are located. However, the upper floors contain some of the best preserved Victorian commercial architecture in the city. The row of buildings, known as the Noble Block, are located on land that in the 1790s was part of the 100-acre Park Lot #15, granted to William Wilcox by Lieutenant Governor Simcoe. The Park Lot extended from Spadina to Huron Street. To the east of it was Park Lot 14, owned by Peter Russell. After John Graves Simcoe departed from Upper Canada (Ontario) in 1795, Peter Russell was the highest ranking official of both the Executive and Legislative Councils. He was appointed Administrator of Upper Canada in 1796 and remained in this position until 1799 when Peter Hunter arrived as the new Lieutenant Governor. Peter Street is named after Peter Russell, as is Russell Hill Road, Russell Street and Russell Hill Avenue. In 1802, Peter Russell purchased Park Lot 15 where the Noble Block is located, and soon thereafter, began sub-dividing the land on its south side, along Queen Street. The small parcels of land were suitable in size for family homes, which began to appear c. 1805. The row houses became known as the Petersfield Row, the name derived from the country farmhouse of Peter Russell, which had been erected c.1799. It was located a short distance east of Spadina, set back from the north side of Queen Street. Today, the site is where Soho Street intersects with Phoebe Street. During most of the 19th century, the Petersfield Row continued to occupy this section of the street. They extended from Spadina Avenue, east to Soho Street. However, the row houses were eventually doomed due to the city’s constant growth, as it was the government and financial centre of the province. By the latter decades of the 19th century, land prices along Queen Street were increasing rapidly, and the building lots to the north and south of Queen Street were becoming fully occupied. This created a demand for more shops and residential properties along busy Queen Street, as it was the commercial centre of the community. As there were no empty lots, the alternative was to raze the low-rise structures and replace them with higher buildings that extended further back from the street. This is why there are numerous tall, narrow buildings along this section of Queen Street. In the late-1880s, the working-class houses of Petersfield Row were demolished to allow the taller structures to be erected. In 1888, seven three-storey buildings were constructed, numbers 342 to 354 Queen Street West. Three-storeys were deemed a practical height in a decade without elevators. Each building was a separate entity, but they were architecturally similar in style, complementing each other. They were named the Noble Block after Mrs. Emma Noble, a widow, who owned the land on which seven of the buildings were located. The funds for their construction were from money she had inherited from her father, William Noble, a retired farmer. The new buildings were a commercial block, with shops on the first-floor level and residential apartments or offices above them. James Smith and William Gimmell were the architects. They designed many churches and wealthy homes throughout Toronto and the province, most of which have since been demolished. Thankfully, the Noble Block has survived. Another widow, Mrs. Mary Ann Harvard, owned the two properties to the immediate west of the Noble Block (#356-358 Queen Street). She intended to invest with Mrs. Noble and add two more buildings to the block. However, for some unknown reason she decided to opt out of the plan. She sold the land and the new owner declined to participate in the scheme. Thus, the two buildings to the west of the Noble Block were not constructed until several years later and are not part of it. When the two latter buildings (#356-358 Queen Street) were finally erected, though the colour of the bricks was not the same as the Noble Block, their ornate brickwork complemented the earlier structures. Today, these two shops are combined into a single store, with the postal address #356. Despite the passage of the years, the row of three-storey buildings remain an important part of Queen Street West. In the Noble Block, five of the red-brick buildings, numbered 346 to 354, have an overall unified symmetrical facade. Above them is a parapet that includes a raised section that denotes the year they were built—AD 1888. The two most easterly of the block, numbers #342 and #344, are not a part of the overall symmetrical design of numbers #346-#354. However, the facades of #342 and #344 are also individually symmetrical. They differ from the other structures in the block as they contain larger arched windows on the second floor. In truth, all the windows in the buildings are wide and spacious, well suited to an era without electric lighting. Some windows contain coloured glass in the top sections, many with blue glass and a few with green. Their designs and patterns add greatly to the overall attractiveness of the buildings. The windows are surrounded by hand-tooled wood trim for ornamentation. As mentioned previously, unless a person is walking on the south side of the street, the fine detailing of these historic buildings is not easily seen. Most of those who pass by only view the ground-floor, where the shop windows are located. Over the many decades since they were built, most of the store fronts, on the ground floor level, have been severely altered and modernized. Number #350 (the shop containing Fraiche) is perhaps the least changed. High in the cornices at the top of the building are dentils, and on the facades there are oriel windows, corbelled brickwork, and other interesting designs. There are so many shapes and patterns in this row of buildings that each time a person examines the structures, often, further details are noted. The Noble Block in 1971, appearing much the same as it is today, only the cars betraying that the photo is almost half-a-century old. However, on close inspection, there is one difference. There is a piece of masonry that juts from the top of the structures, above the parapet, containing the words “Noble Block,” and a pediment above it. It has since disappeared. Likely it was removed as it was in danger of falling to the street below. Toronto Archives, Font 1526, f 10070, item 0052. View looking east from Queen and Spadina in September 1981. The Noble Block is on the north (left-hand) side of the street. The tower of the Old City Hall is visible in the distance. Mature shade trees flank both sides of the street. Most of these trees no longer exist. Toronto Archives, Fonds 1526, F 0076, item 0024. Gazing west on Queen Street West in 1981, the Noble Block mostly hidden by trees. Sadly, most of the greenery has not survived into the present. Photos like this truly remind us of the damage to the environment by pollution. As the trees died, the City replaced them, but the new trees are small and are not doing well. In 1981, the masonry above the parapet at the top of the building still has the part where the words “Noble Block” was located. Toronto Archives, Fond 1526, F 10076, Item 0022. View looks west along Queen Street at the buildings in July 2018. There are no longer many trees to shelter those who stroll along the street from the heat of the summer sun. The top part that denoted the name of the block is no longer on the structure. These five buildings in the centre of the block (#346-#354) have an overall symmetrical design. Though only three storeys in height, they appear taller as the ceilings on each floor are high and there is a parapet (false wall) at the top. The two buildings, #356 and 358 Queen St. now have a single postal address, number #356. This is because they are combined into a single shop on the ground-floor level. These are the two structures that were erected after Emma Noble had completed the Noble Block in 1888. The brickwork on #356 on the top two floors is quite intricate, and the cornice at the top is massive in appearance. There is a flag pole that has not been used in many years. When these buildings were erected, flying the Union Jack was a regular occurrence. The two buildings on the east side of the block do not match the symmetry of the five structures to the west of them, but their designs are also symmetrical. A bay window in the Noble Block, generously framed with wood. At the top of the window, there is blue coloured–glass. The shop at #350 Queen Street, Fraiche, has the only first-floor facade that has survived into the 21st-century. It still has the stained-glass panes above the window and door. The blue door (behind the opened white door) gives access to the apartments on the second and third floors. Photo July 2018. The reflection of the Noble Block appears in the glass facades of the buildings on the south side of Queen Street. The building in the background is the District Lofts on Richmond Street West. The commercial row, which for over a century, has overlooked Queen Street West. The King Street Pilot Project is a fascinating experiment. Allowing public transit to have the priority on streets is common in many cities throughout the world, but Toronto has been slow in adapting this concept. Harbourfront was resigned to emphasize pedestrians, streetcars and cyclists. After many initial problems, it now appears to be a great success. The King Street project too has had its difficulties, but with the return of good weather, it also seems to be doing well. I decided to view the street again, this time on the hot humid afternoon of July 4th. During my visit, with the humidex, the temperature was over 40 degrees. Because of the heat, the street was relatively deserted as most people were dining or drinking inside the restaurants rather than the patios. Despite the lack of activity, I enjoyed observing how much the street has changed because of the Pilot Project. I commenced my exploration at Bathurst Street and walked eastward toward Jarvis. It was an interesting stroll, as it became obvious that some areas of King Street had been embraced by the restaurateurs more than others. The section between Bathurst and Spadina seems to have taken advantage of the Pilot Project the most. This is perhaps logical as this part of King Street as the most patios that are located close to the sidewalk. In the business district, between Yonge and Jarvis, there were almost no patios. However, the Pilot Project had greatly influenced the traffic patterns as the vehicle traffic was light and the streetcars were moving quickly along the street as they were unobstructed. View looks west, a short distance east of Bathurst Street at the patio of Oretta restaurant. The patio beside Wilbur Mexicana Restaurant, at 552 King Street. The patio has not yet opened to the public so remains bare. King Street gazing east from Brant Street on Wednesday July 4, 2018. The brick building behind the row of white umbrellas is the old Gurney Stove, built in the 1870s. Photo of the Gurney Iron Foundry on King Street West on April 13, 1927. The view gazes west on King Street from near Spadina. The streetcar in the distance is where the umbrellas are positioned in the previous photo. Photo from the Toronto Archives, S0071, It.4812 (1). How things have changed since this photo of the Gurney Stove Factory was taken in 2015. View of the same section of King Street after the Pilot Project commenced. This photo was taken from near Brant Street, the view showing the patios of Cibo Restaurant on the north (far) side and the patio of the Spice Route on the south side (in foreground). Patio in a laneway on the south side of King Street, the Gurney Stove Foundry in the background. In the early decades of the 20th century, the lane was where trucks and carts delivered or picked-up goods from the factories on King Street. (left) The patio of Patria in the afternoon, when it was not open for lunch. (right) The patio ready for the evening diners. Patios of Wesloge and Patria at at 480 King Street. Both of these are closed at lunch time. Sculptures east of Spadina Avenue. The view gazes west on King Street. Patio of the Red Tomato at 321 King Street West, the Bell Lightbox in the background. Princess of Wales Theatre at 300 King Street West. Chairs on the north side of David Pecaut Square, opposite the Royal Alexandra Theatre. The Royal Alexandra Theatre at 260 Queen Street West, a sculpture of yellow milk cartons in the foreground. Sculpture on King Street on the north side of David Pecaut Square, the Royal Alexandra Theatre in the background. Sitting area on the north side of King East, opposite the King Edward Hotel. View looks west toward Yonge Street. Another view of the sitting area opposite the King Edward Hotel. The camera is pointed east toward Jarvis Street. A container garden on the north side of King, a short distance east of the King Edward Hotel at 37 King Street East. Another view of the container garden east of the King Edward Hotel. Looking east on King Street toward Jarvis Street. The installations for the Pilot Project are beside St. James Park. A link to the first post about the King Street Pilot Project. The houses on Sunday morning, July 8, 2108. The roof of the house on the south side of the semi-detached homes has collapsed. View of the house on the south side, its roof now missing. View of the damage to the gable that the houses share. The bargeboard Victorian trim survives, though it is in poor condition. View looking at the rear of the houses. The severity of the damage is more evident from this side. View of the second-floor level of the homes, following the fire. Rear view of the houses, Sunday morning, July 8, 2018. Tags: 122-124 Peter St. Toronto, fire at 122-124 Peter St.